In Angola there is a well-known Portuguese saying that sums up the disconnect between appearance and reality: “para o Inglês ver” (literally “for the Englishman to see”). How apt. For it appears that the entire state apparatus under President José Eduardo dos Santos’s rule – constitutional guarantees, democratic principles and the rule of law –exist only for appearances’ sake. 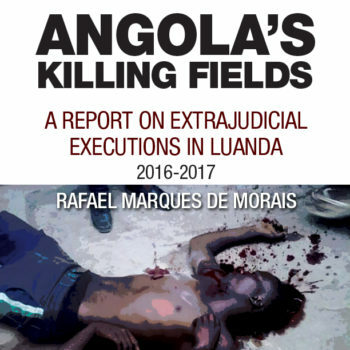 The latest example of blatant disregard of the law involves none other than Angola’s most senior lawman, the Attorney General of the Republic, General João Maria Moreira de Sousa. Maka Angola has documentary evidence that in 2011 three-star General Moreira de Sousa bought from the state a three-hectare parcel of ‘rural land’ with a prime sea view in Tango, in the municipality of Porto-Amboim in the province of Kwanza-Sul. Given its ‘rural’ designation, the land cost a mere 600,000 kwanzas (US $3,600). Thus, the Attorney General personally executed the transaction in the capacity of the real estate investor. With such a heavy-hitter on board, the ‘rural status’ of the land was promptly set aside and the general was able to obtain the parcel for urban use, with permission for the construction of a residential condominium (Process 144-K/11). Of course in the current economic climate it’s possible that any building plans may have to stay in the drawer. But whether or not the condo gets built, the deal raises fundamental questions about probity. Why is Angola’s most senior lawman involved in yet another of that province’s dodgy land deals? Or any deal at all for that matter. Maka Angola’s legal adviser, Rui Verde, says that for the Attorney General to be engaging in a commercial business or property transaction runs counter to the “Principle of Exclusive Dedication” in the Constitution. The principle of exclusivity is a constitutional safeguard to ensure the autonomy and probity of the Attorney General and stipulates that the position of Attorney General is incompatible with the exercise of any other activity. The importance of this clause resides in its intent to prevent each and every person active in the administration of justice, from the Attorney General down to the lowliest magistrate or ministry official, from engaging in any other activity, whether public or private to prevent any potential conflict of interest and preserve autonomy. The only exception is the exercise of functions relating to the academic research or teaching of Jurisprudence. “The principle of exclusivity is not just intended to prevent the Attorney General from being distracted by other activities, but also to prevent any conflict of interest or professional or financial dependency that could put his autonomy at risk,” says Rui Verde. “As an official of the Public Prosecutor’s Office (Ministério Público) he is answerable only to the President of the Republic in matters relating to state representation.” This begs the question of whether he was acting on the President’s orders in involving himself in a property deal. It comes down to this: The Attorney General is at liberty to purchase a plot of land for his own use, such as to erect on it a home for himself and his family just as he may buy a car, or a boat for his own use. What he cannot do, by law, is to involve himself in other activities of a professional or commercial nature, from which he might expect remuneration or profit, such us acting as property developer, a private legal consultant, a business administrator or similar. This is not the first time that General João Maria de Sousa has demonstrated his disregard for Angola’s Constitution and the laws of the land. He has involved himself in business deals before, presumably under the benevolent eye of his patron, José Eduardo dos Santos, who by appointing him, brought him into the fold. This is not the only incidence of the Attorney General’s conflict of interest: He was a managing partner of a well-known real estate, general trading and import-export company named Imexco. His sidekick, the President of the Military Supreme Court, General António Neto “Patonho”, was also a managing partner in the same company while holding office. All at the same time he was peddling private audit, legal and consulting services through Construtel Lda., and Deljomar Lda., while also acting as general manager of Prestcom (Prestação de Serviços e Comércio Geral, Lda). Maka Angola brought this situation to the attention of the President as far back as 2009, in writing. No action was taken. This is how institutional corruption works in Angola. The cardinal principle is “one hand washes the other”, in other words: you scratch my back and I’ll scratch yours. The loyalty and support of the President’s appointees is secured by allowing them swill at the same trough. They all look out for each other and officers of the law function to confer a spurious legitimacy on the corrupt practices of the entire class, while reserving real punishment for the weak and those they wish to exclude from the top table.